René Girard’s Mimetic Theory has given us many important insights into the roots of human violence, both in the human heart and at the root of civilization. By revealing the entanglements of our desires with the desires of others and the way this entanglement easily and quickly leads to rivalry, even in people of good will, Mimetic Theory places strong demands upon us. Being a scholar and thinker, Girard wasn’t the sort of person to work out practical disciplines that might help us live by his theories, although his overall character as known to me suggests that he lived by his ideals very well. I have heard of one telling moment when he was asked how to live by his theory. René answered that it requires sanctity. There are many saints over the centuries who have taught spiritual practices that help us live with the challenges that Mimetic Theory brings to light. Girard analyzed the interaction of human desires on a horizontal level where the workings of mimetic desire in a social matrix can be quite claustrophic. Here we can get hemmed in by the pressure of strong desires that either conflict or draw everyone in one direction that usually ends in persecution. It is this scapegoat mechanism committed at this horizontal level that is the basis of civilization. Given the mendacity that civilization so established requires, civilization has been built on lies since the beginning. This suggests that relief can only come from outside the system, from a desire vertical to the horizontal matrix. The question is, how do we tap into a vertical reality that rises above human mimetic rivalry and offers us an alternative to it? Of the many disciplines that have been developed in the world’s wisdom traditions that help us tune in to reality outside the human mimetic system, I wish to focus on meditation, known as contemplative prayer or centering prayer in the Christian tradition. One of the earliest and most developed contemplative traditions arose within Hinduism by the sages whose teaching were recorded in the Upanishads. It is surely no coincidence that this withdrawal into meditation was accompanied by questioning and sometimes rejecting Vedic sacrificial rituals. Out of Hinduism, Buddhism arose, a tradition in which meditative practices remain fundamental. Buddhists treatises on meditation often show deep insight into the working of mimetic desire and the need to escape its violent aspects. There seems to be a contemplative element to much ancient Greek philosophy but I haven’t found much in the way of contemplative practices there except perhaps the Pythagorean community, for which information is scanty. Judaism also produced little in this regard but the many references to meditating on God’s Torah, especially in Psalm 119, suggest that the study of Torah may have included a meditative aspect. 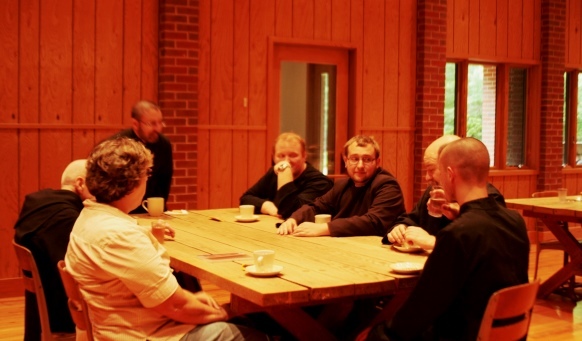 By the fourth Christian century, monasticism had become a highly organized institution. The earliest monastic literature of pioneers such as Anthony of Egypt and Pachomius refer to free-lance ascetics who initiated them into contemplative practices., suggesting that practitioners of contemplation go back to Christianity’s earliest years. The many challenges in Jesus’ teachings involving self-knowledge and self-discipline, especially the Sermon on the Mount, were enough to drive many people into the desert just as Jesus himself was driven out into the desert to prepare for his public ministry. The Beatitude “Blessed are the pure of heart for they shall see God” was among the most meditated on verses in all scripture in this early monastic movement. There are many ways this beatitude can be understood, but surely one of them is that the less a person is affected by rivalrous mimetic desire and the more attuned to the non-rivalrous model of Jesus’s Desire, the more pure of heart one is. Contemplative prayer did not develop in Christianity as an antidote to mimetic rivalry. 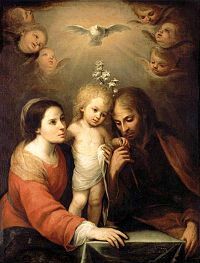 The purpose of contemplative prayer is to reach union with God through Christ under the inspiration of the Holy Spirit. Even so, the more we learn of mimetic desire, the more we realize that union with God through Christ in the Holy Spirit is a powerful means of withdrawing from mimetic rivalry and developing habits of the heart that foster nurturing other people. Among the differences in contemplative disciplines in various traditions, there are many similarities. The greatest of these is that the nuts and bolts of contemplative prayer, if you will excuse such a mechanical image, seem to be roughly the same across the board. In these traditions, including that of psychologists who recommend meditation for the sake of mental health, the primary technique is a gentle focusing of the mind that collects a person and leads to a withdrawal from the inner noise that plagues us most of the time and often fuels mimetic rivalry. Zen Buddhist masters aptly call it the monkey mind. The approach to focusing should always be gentle. When the monkeys in the mind get active, they are irritating and it is tempting to get angry at them and try to swat them away. In this way we easily get caught up in mimetic rivalry with the monkey mind, which is the opposite of meditating. More problematic, when we try to quiet the mind in order to meditate, we often find our minds filled with rivalrous thoughts where every little grudge or slight blows up and takes center stage. It is enough to make us think that trying to meditate makes us more rivalrous than we were before. That is not the case. What is happening is that rivalrous desires and actions that were below our radar have become more visible in the quiet space we are clearing within us. The noise of mimetic rivalry does not like silence so it makes a huge racket to try and draw us back into the fray until we take it for granted once again. As with monkey mind distractions, it is self-defeating to engage in battle with rivalrous thoughts. We must do the opposite: let the racket continue on its own steam without any fuel from ourselves. Of course, it won’t do to try not thinking about whatever distracts us. We must return to whatever focus we are using for our meditation. It is when we look at how we focus or what we focus on and the world view we bring to contemplative practice, that we see the differences between traditions. A Christian’s primary focus is Jesus Christ crucified and risen as the normative example to follow. Even if a Christian does contemplative practice without images, the Christian is moving inside the example of Christ. The Spiritual Exercises of Ignatius of Loyola use structured meditations that often involve putting one in a Gospel scene, reliving it interiorly, and making a resolution to apply the fruit of the meditation. Much Buddhist meditative practice is without images but within Tibetan Buddhism, many elaborate mandolas have been devised to focus meditation. Whatever examples we have in our traditions, we open our hearts to invite them to enter deeply within us so that their desires can resonate within us. The type of focus that mainly, or totally eschews images turns up in just about every contemplative tradition but there is usually a means of focusing that is not tied to images. Many Zen practitioners use a koan, Hindus a mantra, Islamic Sufis practice dhikr. Repetitive prayers turn up in the desert monastic tradition in Christianity, with many of these monastics saying a Psalm verse over and over again. The opening verse of Psalm 70: “O God make haste to help me” was a favorite, noted in the writings of John Cassian. The Eastern Orthodox tradition fostered the Jesus prayer which involves repeating the name of Jesus. The anonymous 14th century English classic The Cloud of Unknowing suggests focusing on a prayer word such as “God” or “Love.” Contemporary teachings on centering prayer are deeply indebted to this treatise. Whether a focusing technique begins with images or without, over time, contemplative practice moves beyond images, beyond thought, and sometimes beyond the focusing technique into a state that is paradoxically called both emptiness and fullness. If and when such a state happens, there is nothing to do but just be. I have used the word tradition many times. That is because the practices I have been talking about have developed in traditions where teachings were handed down from generation to generation. In these traditions, contemplative practices are deeply grounded in scriptures, teachings, and liturgical practice. 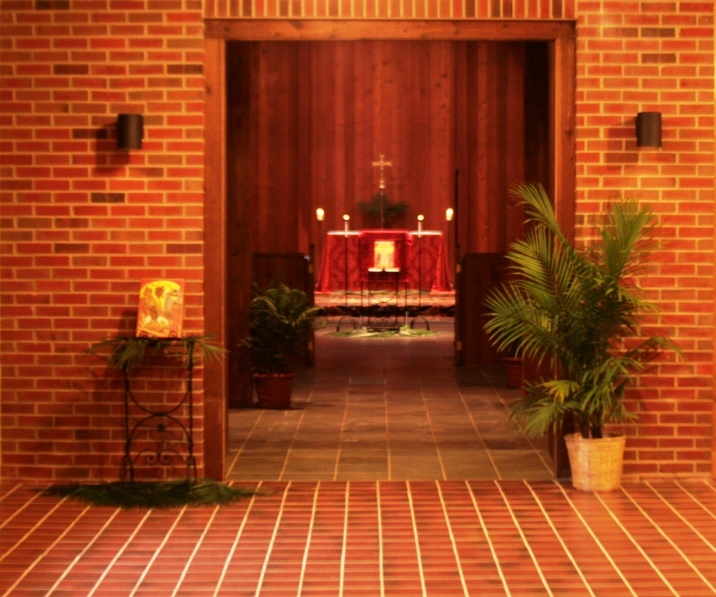 Contemplative practice is best performed within a tradition accompanied with respect for other traditions. This has become a problem for many people in modern and post-modern times where a sense of tradition is eroding. Sometimes this erosion can be blamed on people desiring to be autonomous, a trait that Mimetic Theory warns us makes us all the more susceptible to mimetic movements in society. Many times, however, it is a result of scandals within the various traditions where trust has been compromised. In any case, awareness of the traditions in which contemplative practices are embedded is important and can be enriching. The more one can participate in an deep tradition, even if marginally, the better. Contemplation is an exercise in letting go and letting God, to use a phrase made famous by Alcoholics Anonymous. It is worth noting that contemplative meditation is one of the twelves steps of recovery for addiction. In renouncing the monkey mind, we are also practicing the renunciation of mimetic rivalry. This is a practice that can have real effects in our lives as it gives us practice in renouncing mimetic rivalry in our day-to-day encounters. Mimetic Theory teaches that we are connected to everybody through the interaction of our desires. In rivalrous encounters, we are stuck together in rivalry. Contemplation opens us up to all other people through God’s Desire that is outside of the system. This divine Desire invites us to union with all sentient beings through the Desire that set all of Creation into motion at the beginning before the beginning of civilization. In Christian theology and much more so in mysticism the negative or apophatic way and the affirmative way are posited as a fundamental contrast but actually they are two sides of the same coin. We can’t get anywhere if we can’t say anything about God and yet everything we say about God has to be wrong. God isn’t a rock on somebody’s front lawn any more than God is Pure Being. The dark cloud on Mount Sinai, the Cloud of Unknowing and the Dark Night all indicate negation and yet dark clouds and dark nights are still images that have to be denied. With that said (or unsaid) I will focus on the affirmative way even as I have to negate it at every turn and I will relate the affirmative way to mimetic theory. Many see God in nature. Even unbelievers tend to feel some reverence when they see mountains and trees and squirrels scurrying about. The stars in the sky and stones and lakes and growing things all resonate with God’s Desire. God has profound respect for even the smallest pebble and hazel nut because God willed them to be. The more we participate in God’s Desire, the more we also will respect what is in nature and, although we must use nature, we will use nature in a sharing way rather than dominate it. Nature does not grasp at anything. It just is. This is why nature can teach us to desire in a non-rivalrous way. The affirmative way is often experienced in human relationships. We see Christ in other people even though they do not always (or often) act like him. While the lilies of the field do not strive for the things of tomorrow, people do. In marriage, at least when it works reasonably well, one’s spouse is the primary image of God to the other. There is nothing romantic here as each partner knows very well the foibles and vices of the other. In community life, such as in a monastery, there is not, of course, the focused spousal relationship (except with God) but we have daily opportunities to see Christ through the struggles and kindnesses of others in the community. The image of Christ in the Gospels helps us straighten out the distortions that other people create even as Christ plunges us deeply into his presence within them. Learning to resonate constructively with the desires of other people is part and parcel of learning to resonate with God’s Desire. One way we participate in God’s image is by creating art. No Lilly pad looks like a painting by Claude Monet but the dissolving images of lily pads on his canvases cause us to resonate with the inner life of these lily pads and to see them in real life in ways we never would otherwise. The flowers in Georgia O’Keefe’s painting are atomic explosions. Thanks to J.R.R. Tolkien and his Ents we know how God feels in the rumbling roots of trees. Our sense of the sorrows of others is never the same after seeing any of the mournful clowns in the paintings of Georges Rouault, not to speak of the overwhelming agony in his paintings of Christ. 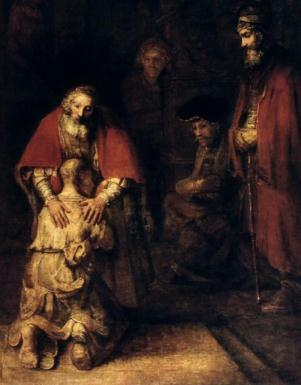 We resonate with a certain deep level of Christ’s love through Rembrandt’s famous painting of the Prodigal Son. Probably no person experienced Divine Love through a human being as the fictional Dante did with Beatrice in The New Life and the Divine Comedy. In real life Dante seems to have had no more contact with Beatrice beyond being waved at while passing in the street. But in Dante’s imagination the ever deepening smile of Beatrice as she leads Dante to the heights of Paradise transfigure the smiles of those we love on earth. Music is quite apophatic in that, in itself, it has nothing to do with images and refers to nothing beyond itself. Although music might be set to words, it resists being explained in words. There is a sense of mystery caught in the motets of Thomas Tallis that is not caught in any other way. The constantly shifting keys and moods in the Schubert piano sonatas defy explanation. Music is, however, highly sensuous and it resonates deeply with our mirror neurons. Simple hymns are magnified throughout our bodies when sung in congregations. Scripture, and not least the Gospels, are filled with images that must both be posited and negated. We know God is not a fretful woman who loses her money and people are not small round metal objects. But the Parable of the Lost Coin teaches us how solicitous God is for us and how precious we are in God’s sight. In John, Jesus says he is the bread from Heaven but resists being taken as only a distributor of bread. In the Eucharist, we know Jesus is not bread and wine and yet we taste Jesus in the bread and wine and are fed by him so that Jesus penetrates into deep layers inside us that we will never know of except through a glass darkly. Faith is often presented as conformity to a set of doctrines like those laid out in the Nicene Creed. I believe in what the Nicene Creed says but believing it isn’t faith. 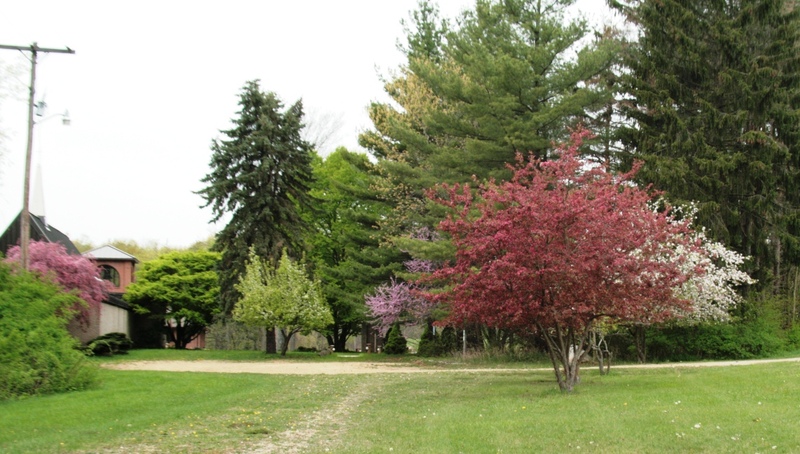 If we turn to St. Paul we find something different. It is often believed that Paul says throughout his epistles that we are saved by faith in Jesus Christ, suggesting that if we believe that Jesus died and rose from the dead, we will be saved. That is, we substitute a more primitive Creed for the Nicene. But this is not what Paul said. In his exhaustive and exhausting book The Deliverance of God: an Apocalyptic Reading of Justification in Paul, Douglas Campbell argues that Paul’s phrase should not be translated faith in Christ, but the faith of Christ. This doesn’t seem to make much sense because Jesus couldn’t have believed in any kind of doctrine. Paul must be talking about faith in some other sense. That is what Campbell thinks when he suggests that a better translation of the word Greek word pistis would be “faithfulness.” That is, Jesus’ faithfulness to his heavenly Father by enduring the mockery of humans and the cross and then being raised from the dead saves us. That is, the faithful acts of Christ save us. We are not saved by our faith; we are saved by Jesus’ faithfulness. This also fits the understanding of “faith” in the Hebrew prophets. When Habakkuk said that “the righteous live by their faith,” (Hab. 2: 4) he was saying that the righteousness live by acting in faithfulness to Yahweh. When James said that faith without works is dead, he was really saying that if there are no works there is no faith because works, the acts of faithfulness, is an integral part of faith. We can see this point more clearly when we reflect that for Paul Abraham is the father of faith because of what he did when God called him by name. Abraham was told to leave the only life he had known and move to a land God would show him. This is precisely what we are called to do in baptism. We are to leave the life we have known, the life that has formed us and clothed us in what Paul calls “the old person” and move to a life we have never known, a life that will form us and clothe us in “the new person.” This may seem laughable to those of us who were baptized as infants but the baptismal vows of renouncing the world, the flesh and the devil, even if made on our behalf, are still our responsibility as we come of age. We find ourselves formed by the social matrix around us which René Girard argues is run primarily by mimetic rivalry and sacrificial mechanisms and we are called out of these social matrixes into a way of life grounded in the Forgiving Victim. What makes Abraham’s journey so remarkable is that he was travelling into uncharted territory. He moved out of a culture based on sacrificial violence without a New Testament in his hip pocket to tell him what kind of story he was entering. In this way he was a pioneer of faith about as much as Jesus. Both put their lives on the line, though in different ways. Abraham only had a promise that his descendants would be as numerous as the stars in the sky, although he had born no children up to that time. Jesus hoped to receive from his heavenly Fathers descendants just as numerous (Jn. 17: 10) although it looked hopeless when even his disciples deserted him at the end. Abraham’s wife Sarai went with Abraham on this journey, making her also a great pioneer of faith. I doubt that either of them could have done it alone. It is because this pioneering move is so fundamental to Abraham’s faithfulness that Paul denies that being circumcised constitutes the faith that was reasoned as righteousness. (Rom. 4: 9-12) That is, Abraham was circumcised after he had set out for a new land. Abraham’s geographical move was not enough, of course. Indeed, if faith has to do with migrating from a sacrificial culture, it is the spiritual geography that matters. After all, Canaan was as in the thrall of sacrificial culture as Ur of the Chaldeans. The real act of faithfulness was bringing Isaac back from Moriah. In a culture that demanded sacrifice so powerfully that even Abraham thought he had to participate in it, he listened to the voice from outside the system that told him not to lay a hand on the lad. On his way to Calvary, Jesus as a pioneer of faith (Heb. 12:2) had to believe that he had been sent from outside the sacrificial system and would return to a place outside that system after having cracked the structure for all time.